Brighton Dome is to host John Cole and David Westhead's extraordinary photography exhibition Wembley To Soweto – A Photographic Journey as part of Brighton's Black History Month. A collection of over 50 images shot by disadvantaged teenagers from the Johannesburg townships, the project has become a global initiative that provides professional photographic training and life-skills to disadvantaged youngsters in order for them to move their own lives forward and, ultimately, make a positive contribution to the society in which they live. The story behind Wembley To Soweto – A Photographic Journey begins in 1988, when - whilst 600 million viewers tuned in on TV and radio - more than 80,000 people attended a concert at Wembley Stadium to celebrate the 70th birthday of Nelson Mandela. The iconic photograph of that momentous day was taken by the internationally renowned photographer John Cole, which now hangs on the wall in Mr Mandela’s home. Over twenty years later, in 2010, David Westhead of Wilton Pictures invited John to run a four week intensive photography course in Johannesburg. The course, run in conjunction with Umuzi Photo Club, afforded an opportunity for eight teenagers from the townships to work alongside one of the world’s best photographers. This course was not solely about taking striking images; it was about how to feed your family using a camera as the tool of your trade. The exhibition collects the pictures they took and offers an insight into daily South African life as the country prepared for and experienced the World Cup 2010. Involvement with the project has helped empower the young people to fulfil their hopes and dreams. Participants have been awarded full scholarships and bursaries to photographic colleges, had work published in magazines including Marie-Claire, have completed shoots for Vodacom and the South African Parliament and had images exhibited in top galleries in New York, Antwerp and Johannesburg. Furthermore, Wembley to Soweto images are on permanent display on the BBC and Guardian websites. One photographer – Thapelo Motsumi - was invited to be guest of honour at Newcastle United where the exhibition filled the stadium for the Barclays Premier League game against Liverpool on April 1, 2012. One of his photographs was blown up to 20m in diameter and displayed on the centre circle in front of 55,000 fans in the stadium and 200 million TV viewers world-wide. A replica of this photograph is now on permanent display in the Leazes End of the stadium. Awarded a scholarship to the Market Photo Lab in Johannesburg, Motsumi has just been offered an apprenticeship with the Times in SA. In a recent pilot scheme with Greater London schools, the project directly reached approximately 4000 young people, from primary school to college level. It brought the acclaimed Wembley to Soweto exhibition to local venues and provided access to a number of workshops run by professional photographers. Following the extraordinary success of the original programme in South Africa, Wilton Pictures has now launched a major national campaign aimed at encouraging children and teenagers across the UK to pick up a camera and discover the incredible rewards and power of photography. Using photographs from Wembley to Soweto as a teaching tool from which students globally can learn and draw inspiration, the project’s goal is to ignite a passion for photography in young people, regardless of their means and background, giving them a creative voice and a unique opportunity to express themselves. Two young participants involved in the scheme were recently invited to be official photographers with the Africa Express – working alongside and photographing the likes of Damon Albarn and Sir Paul McCartney. Working in direct partnership with local government Wilton Pictures will continue to run this series of photography courses in major cities and towns throughout the country over the next six months. 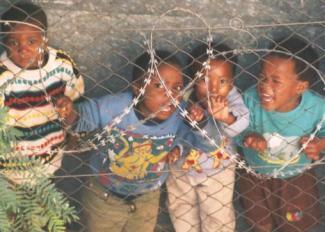 Wembley To Soweto – A Photographic Journey at Brighton Dome until Friday 19 October - 10am-5pm - Free. See brightondome.org for more details.